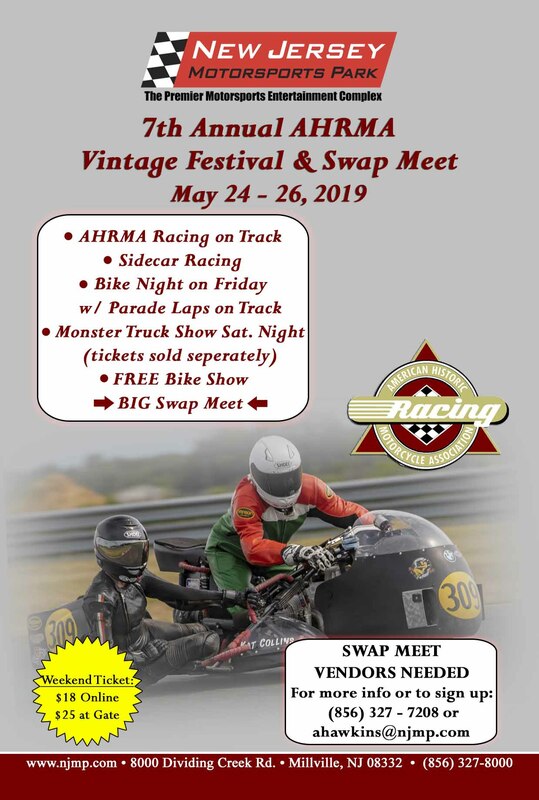 Our club has once again been invited back to New Jersey Motorsports Park for their 7th Annual AHRMA Vintage Festival & Swap Meet. 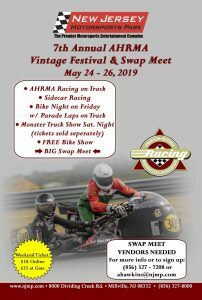 This year there will be some exciting events to go along with the fantastic weekend long AHRMA racing! Starting Friday evening is a Bike Night at the on site Finish Line Pub and a few parade laps on the 2.25 mile Thunderbolt Raceway. Saturday evening brings out the freestyle Monster Truck Show . There will also be a free to enter Bike Show (date and time yet to be set). While all this action is going on, there will be a large Swap Meet going on for you to find that next project! Updates will be coming, so mark this on your calender as a must do event! The area is a hotbed for vintage Japanese Motorcyles of all makes, models, and sizes. Everything is welcome for the VJMC display: Race, Motocross, Customs, Moped, or just clean Stock bikes!